Great holster for off duty. Great holster. Close to the body and out of the way. Feels very comfortable and was a tight fit for the gun. Fits my Block 42 perfectly. I rarely carry the revolver that this holster is intended for, concealed, but this holster does the trick when I do. My only complaint is that it doesn't cinch down quite as tight as I would like so it's not as secure as it might be. Great holster, fits my SW shield awesome. Would this holster fit a Remington 1911 R1 Enhanced (no rail). No, the evolution will not fit a standard 1911 with no rails. Please look at the "Fobus Self Locking Paddle Holster part no. 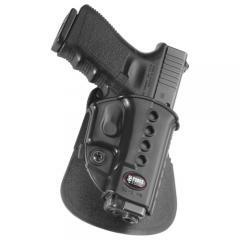 'C21'"
Will a PT111 G2 9mm fit this holster? Unfortunately this holster will not work with the PT111. Please look at the "Fobus ROTO Self Locking Paddle Holster". Is this holster a good fit for the Taurus 740 Slim? Yes, it will fit the Taurus 740 Slim. Will this holster (for the CZ P-06) fit the P-07 Duty? No, it is not the same fit. At this time, it is not available for the P-07 Duty.